The City offers a seasonal leaf collection service that runs from October 1 to December 31. During Leaf Season only, your hauler will collect up to 5 additional bags (preferable clear plastic) of leaves at no additional charge. Place the bagged leaves next to your green/food waste cart on your regular service day. Remember, leaf bags must only contain leaves. If a bag contains leaves mixed with grass trimmings, branches or other non-leaf content, the bag will not be collected without an “Extra Service” sticker. After December 31st, only bags with “Extra Service” stickers will be picked up. See program details. Adding yard waste to a backyard compost pile diverts organic waste from ending up in a landfill. Find out more. If your household generates large volumes of yard waste, consider buying power tools to transform green waste into mulch: a mulcher, shredder and chipper can get the job done. Can I Make My Compost Pile Break Down Faster? 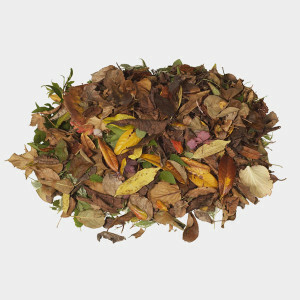 Your compost pile breaks down faster if you mix together the right amounts of green and brown material. Your brown to green ratio is based off of your carbon to nitrogen ratio: 25-30 parts carbon to one part nitrogen is ideal. Keep in mind that food or yard waste all have different C:N ratios (shown here). Don’t get out your calculator for these ratios, instead approximate how much you put into the compost pile.